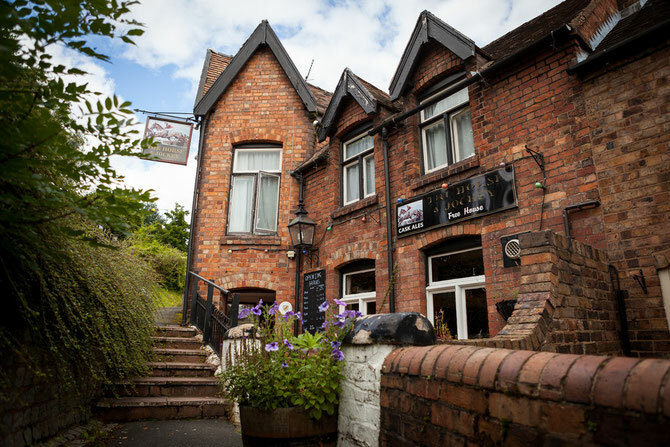 The Horse and Jockey is a traditional free house, over 200 years old, with many original features, located on Jockey Bank just on the way into Ironbridge Gorge. The small bar area is ideal for a cosy drink, whilst the rest of the pub is mainly used for dining. We have an extensive menu which includes traditional steaks and grills, many home-made specials including our famous pies which we vary weekly. We are happy to welcome well-behaved children and well-behaved dogs. A good selection of house wines are available, as well as real ale. At the rear of the premises is a courtyard garden backing into woodland with some seating overlooking the woods. Ironbridge is a World Heritage Site which is a renowned and historic former industrial town nestling in the Severn Gorge, the River Severn cutting its way through the steep wooded slopes of the gorge forms one of the most striking and distinctive landscapes in England and worthy of its World Heritage Site designation. This remarkable area was at the heart of the industrial revolution in the late 18th and early 19th centuries and became world-famous in 1779 when the worlds first Iron Bridge was cast at nearby Coalbrookdale. The area is steeped in industrial heritage with local museums including the renowned Blists Hill Victorian town open air village at nearby Madeley and the world-famous china works at Coalport.